They were born August 30 so will be a great age for a Nursery dog. 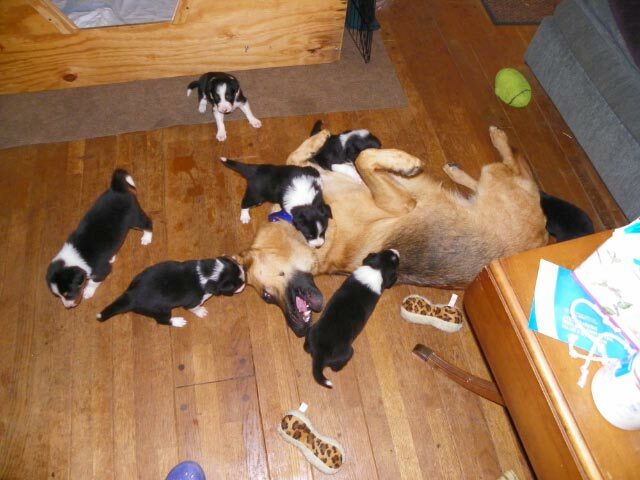 Dot is a great mother and had a very easy delivery … having all of them in around 2 hours! However, sonogram said 6 and out came 8 — 7 of them females! The are growing and going from squiggly worms to trying to “walk and talk” :@) The tri is starting to come out in some and seems to be a very rich brown. They are all sold. HERE for a video of pups.